Kea (also known as Tzia) is the Cycladic island closest to mainland Greece (county of Attica). It is connected daily to Lavrio port with scheduled ferries, and there are many itineraries during the summer months. The journey lasts one hour. The port of Lavrio is approximately 35 km away from the airport and 75 km away from central Athens. There is urban transport KTEL which departs from PedioAreos to the port of Lavrio and back. The journey from PedioAreos to Lavrio port lasts one hour and a half. You can get to Lavrio port from anywhere in Athens via the AttikiOdos, in your own car, in 40 minutes. Kea is a great place to escape from Athens for the weekend or more days, since you only need 2 hours door-to-door from Athens to Kea. The ferry ticket costs 11 euros per person, while a car is charged approximately 9 euros per meter, therefore a medium size car costs around 32 euros one-way. 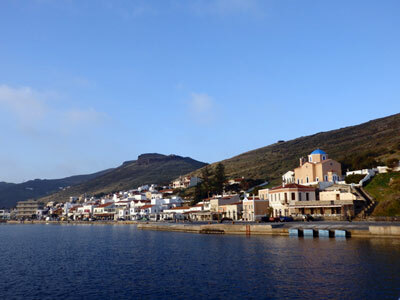 There are two ferries that connect Kea to Lavrio, which are MARMARI EXPRESS and MAKEDON. You need to have made a reservation in advance in the ferries, especially during the summer months. If you do not have your own transportation you can rent cars or motorbikes in Korissia. Demand during the summer months for rented cars and motorbikes is increased so you need to reserve in advance. If you do not wish to take your car with you to Kea there is a large guarded parking lot in Lavrio port, which charges 5 euros/day.